Falcon buses have taken over the former Excetera service for route 28 (and the 91). The new time table can be viewed by clicking on the link below. We’re writing to ask if you, or someone you know, could become a Special Constable? The Special Constabulary is made up of members of the public who volunteer to spend their time helping to police their local community. Specials play a crucial role in fighting crime and keeping Surrey safer. They come from many different backgrounds and walks of life, forming a vital link between their community and Surrey Police. Recruitment for Special Constables is now open and we are looking for people with a passion for helping their communities. The role of Special Constable will provide you with opportunities to learn new transferable skills and gain valuable life experience. Specials wear the same uniform and carry the same powers and responsibilities as our regular officers, whilst working alongside colleagues on your Area Policing Team. Once successfully through the application process you will receive 12 weeks of initial training, which includes one evening and one Saturday per week, followed by further training once out on your chosen borough. If you are considering a career with the police, this is a great place to start as you’ll gain experience of what it is like and if it’s for you. To find out more about the role and to apply click here. The application window closes on 28th January 2019. On 15 February 2019 Surrey County Council will make the above mentioned temporary order, the effect of which is to prohibit all traffic on foot or by any other means from entering or proceeding along that length of Public Footpath No. 442 (Worplesdon) which extends from its junction with Cumberland Avenue (Grid ref. 498239 152764) in a generally north easterly direction for approximately 113m. The Order is necessary on the grounds of public safety due to works being executed on or near the footpath. The closure will be in operation from 18 February 2019 until 12 April 2019, or until completion of the works, if earlier. That period can be extended by the Secretary of State for Transport if required. The prohibition described above will only be operative while the County Council, or an authorised person acting on its behalf, displays signs prohibiting the said movements. Access to properties will not be affected by the temporary closure. The alternative route from the south western end of the closure is to proceed in a south westerly direction along Cumberland Avenue to its junction with Lyons Drive. Turn right onto Lyons Drive and proceed in a north westerly direction to its junction with Lyons Drive Footway. Continue in a north westerly direction along Lyons Drive Footway to its junction with Footpath 444. Turn right onto Footpath 444 and proceed in a generally north easterly direction to its junction with Footpath 442. Turn right onto Footpath 442 to the north eastern end of the closure. The alternative route for traffic from the north eastern end of the closure is the reverse of the route described above. ‘The Surrey County Council Public Footpath No. 442 (Worplesdon) Temporary Prohibition of Traffic Order 2019’ will be made by the County Council under Section 14(1) of the Road Traffic Regulation Act 1984. Merrow Lane, Guildford GU4 7BQ. Tel: 0300 200 1003 or email: rightsofway@surreycc.gov.uk. The Worplesdon Memorial Hall, recreational ground and Sime gallery trustees in Worplesdon are so grateful to local people and for the volunteering they do. 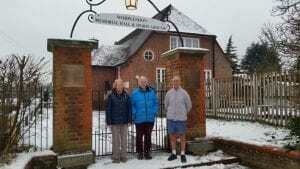 The hall will be 100 years old soon; it was built from a donation on land gifted to the village for the purpose in memory of those, who lost their lives in the Great War. 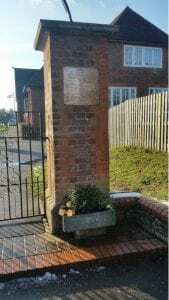 The enchanting entrance gate has just had a make-over by volunteer Dennis Stewart, he is the husband of Marjory the Trust’s voluntary secretary. He has cleaned the name plaques of those who died in WW1 and WW2 repaired the pillars and entrance light above and painted all the iron works and sign above. With the generous donation of stone plant pots from Dave Jenkins of Perry Hill Antiques, Worplesdon and Lyndon Weeks of Holly Lane landscapes Worplesdon who has planted skimmia, japonica rubella, confusa , primula vulgaries and heuchera for all to enjoy as they walk past or come to use all the facilities on offer. The trustees are grateful to all those who have volunteered and have done something very special for the community. The recreation grounds not only have a large children’s play area and tennis courts for hire provided by Worplesdon Parish council there is also an outdoor tennis club used daily and flood lit for night time use. Worplesdon football club and cricket club play regularly and use their excellent facilities in the pavilion. The large hall and additional rooms are available to hire and we are fortunate to have a variety of things on offer for all as regular bookings, we are always looking to offer more. Maybe the facilities will meet your needs. Including for weddings and children’s parties. The main hall has recently been redecorated and there is a spacious new kitchen. Many people forget we have our hidden gem in Worplesdon The Sidney Sime art gallery. The gallery houses a major collection of the fascinating and highly characteristic work of Sidney Sime 1865-1941 the famous artist, illustrator and caricaturist, who lived in the village. We are delighted to say 5 volunteers are going to be researching and archiving for the gallery. The gallery is run by volunteers Trustee Mary Broughton and curator Anne Philps. Who can be contacted at enquiries@sidneysimegallery.org.uk or 01483 233869. We look forward to celebrating our 100 years very soon, please do get in contact via our website worpmemhall@hotmail.com or 01483 232117 for more information about the facilities on offer. Perhaps you would like to share pictures or memories for our centenary celebrations. Trustees can be contacted via enquiries@worplesdonmemorialtrustees.org.uk . We look forward to welcoming you and hope that you will enjoy the centenary celebrations officially will be in 2022. In the very near future the trustees invite you to “Worplesdon Past, People and Place” a talk by David Rose, Geoff Burch and Stephen Cranstone. Sunday 3rd March 3-5pm in the Worplesdon Memorial hall. Is your nearest polling station easily accessible? The Council is reviewing its polling districts and stations and wants local residents to give their views. We would like to know what you think about all aspects of polling, including current sites, recommendations for new locations and opinions on existing sites. Suggestions and feedback for alternative polling places in the borough are welcome. We also encourage comments from individuals with expertise about accessibility for those with disabilities. The statutory review aims to ensure that during parliamentary elections voting facilities are accessible for all. A review is carried out every five years. Anyone registered to vote within the Guildford Borough or Guildford Parliamentary Constituency can have a say. 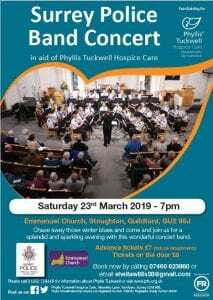 In aid of Phylis Tuckwell Hospice Care. Tickets: £7.00 in advance, £8.00 on the door. To book your seats, please call the box office on 07460 623860 or email sheilawillis38@gmail.com. A significant amount of builder’s debris has been fly tipped at Pitch Place Green. This has been reported to the Guildford Borough Council cleansing team who will endeavour to collect it within 36 hours. Fly-tipping is a criminal offence punishable by a fine of up to £50,000 or 12 months imprisonment if convicted in a Magistrates’ Court. The offence can attract an unlimited fine and up to 5 years imprisonment if convicted in a Crown Court. If you witness a fly tip in process, please call the Police on 999. Would you like to become a borough councillor? Do you want to make a difference in your community? Perhaps you have strong views on how local services should be provided and want to help improve the quality of life in Guildford. As a local councillor you will make decisions that touch the lives of everyone who lives, works, or visits Guildford. So it’s not an easy job but it’s important and rewarding. It’s vital that local councils represent the full range of local opinion. Guildford Borough Council encourages all members of the community to consider becoming a councillor. 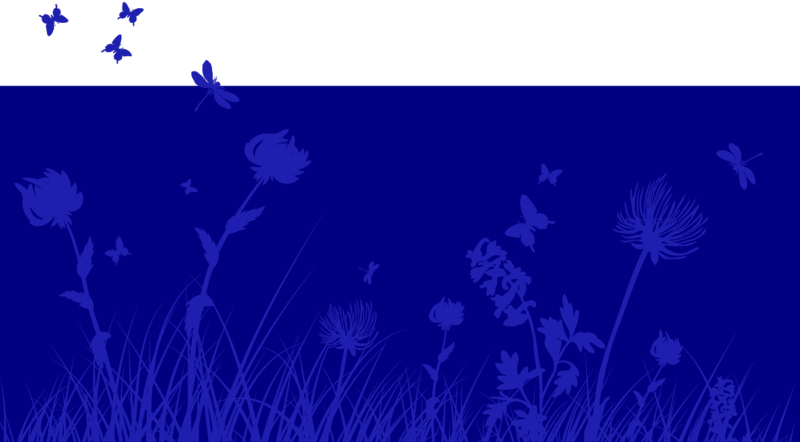 Visit Be a Councillor to find out more about becoming a councillor at Guildford Borough Council. The next event to find out about Becoming a Councillor will be held on Monday 11 February 2019 from 6pm to 9.15pm in the Council Chamber at Millmead House, Guildford GU2 4BB. We would like to encourage anyone interested in becoming a local councillor in Guildford to attend. Find out more and register your interest in the event on our Becoming a Councillor events page. (a)	What made them decide to stand for Council? (b) What difference do they think they have made for their ward and the borough? (c) What has frustrated them? 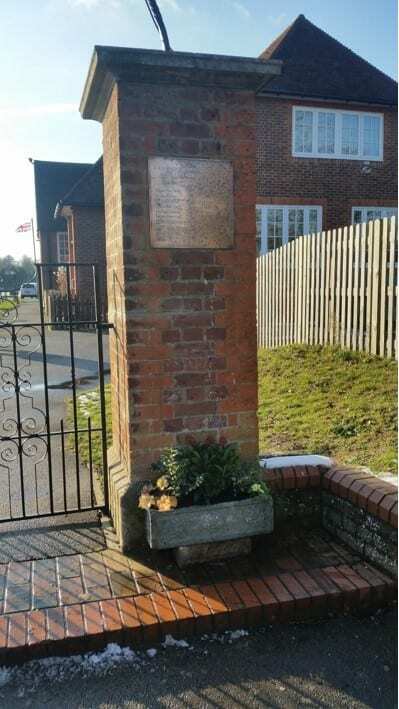 (a) What made you stand for election to Ash Parish Council? (b)	What difference do you think you have made for the parish? (c)	What has frustrated you? “The government’s Planning Inspector will hold another public hearing, at the Borough Council’s offices in Guildford, as part of his independent examination of our submitted Local Plan. Cllr Paul Spooner, Leader of the Council, says: “The government’s Planning Inspector found our Local Plan to be substantially sound on all key tests during this summer’s public hearings, which form part of his independent examination. He has also indicated that, as they have already been thoroughly discussed, he will not revisit issues such as spatial strategy, strategic sites and constraints in the next public hearing in February 2019. The Inspector will focus on the overall housing requirement and the possible implications arising from the latest Office of National Statistics (ONS) household projection figures. We have now sent the latest consultation feedback to the Inspector for him to review the comments before completing his examination and final recommendations to the Council. The Inspector has also indicated that he will consider our latest documents about the new Office of National Statistics (ONS) household projection figures alongside the comments from the 2018 consultation. You can find out more information about the hearing on 12 and 13 February on our website, including the Inspector’s Note, Matters and Issues and a Programme of Participants as soon as they are published. Safety is Highways England’s top priority. As part of our ongoing commitment to safety we will be undertaking the following improvements at Guildford in 2019. Highways England will be introducing average speed cameras on the northbound 50mph speed limit section through Guildford, between the Hogs Back and Wooden Bridge junction. Speeding vehicles and incidents on this busy downhill section of road are widely acknowledged issues. Average speed cameras should help to make the road safer by reducing congestion caused by incidents and also smooth out traffic flow. Average speed cameras have been shown to encourage a better level of compliance with speed limits over longer distances. They can also have a traffic calming effect as vehicle speeds tend to be more consistent and reduces the need for heavy braking, and the risk of incidents. The cameras will be yellow in colour and will have clear signage so that drivers know they are there. ‘Average speed check’ signage will be installed at the entry point to the enforced section and additional repeater ‘camera’ signs will be installed along the length of the enforced section to remind drivers. Installation works on the A3 will be carried out at night for which carriageway and lane closures will be needed. These closures will be communicated in advance. Installation is expected to take place in 2019. The existing footpath between the slips will be closed and an improved footpath will be installed along the slip road up to Egerton Road. Improvements will bring better traffic flows through the junction reducing the tailbacks on the slip road. The southbound exit slip road currently operates at near full capacity due to the volume of traffic leaving the A3 at the junction, leading to tail backs on the A3 southbound carriageway. The existing slip road will be widened to bring the existing narrow lanes up to current standards and to extend the length of the marked lanes. Their scheme will also incorporate improvements in the traffic signals in conjunction with Surrey County Council. Improvements will bring better traffic flows through the junction reducing the tailbacks on the slip road and dual carriageway. For the safety of their workforce and customers, it is expected that the majority of the work will be done using overnight lane closures and overnight closures of the slip roads at the University and Stoke Interchanges. There will also be a requirement to close the slip roads at the Stoke Interchange over two weekend periods, to allow their works to be combined with those being undertaken by the local highway authority. Dates are yet to be confirmed, but will be communicated to our customers in advance. The events will be held on Friday 18 January between 2pm and 8pm; and on Saturday 19 January between 11am and 5pm at The Guildhall, High Street, Guildford, GU1 3AA. Highways England have been in consultation with Surrey Safety Camera Partnership, Surrey Police and the Asset Support Contractor about these proposals. Cyber criminals send victims their own passwords in extortion scamCyber criminals are attempting to blackmail unsuspecting victims by claiming to have used the victims’ password to install spying malware on the victims’ computer. The criminals claim they’ve recorded videos of the victim watching adult material by activating their webcam when they visit these websites. What makes this scam so convincing is that the email usually includes a genuine password the victim has used for one of their online accounts. We believe criminals obtain the passwords from data breaches.What to do if you get one of these emails? Now the longer, darker nights are approaching, now is a good time to think seriously about your home security. Burglars love dark nights and they also love it when we make their job easier. Traditionally we see a rise in burglary offences at this time of year with the darker evenings and offenders will take every opportunity to target properties, particularly on specific days when they know that people may be out for some time. Halloween and Bonfire events may leave homeowners vulnerable if proper security measures haven’t been put in place. 📱 Register your property on Immobilise, the world’s largest, free, property register. It’s simple to register property such as technology, jewellery, bikes, antiques and collectibles and registering your property could help us reunite you if it’s stolen. Visit immobilise.com to get started! 🔦 Mark your property with a forensic marker fluid, such as SelectaDNA. This clear liquid carries its own unique synthetic DNA which is only visible under ultraviolet light. For Surrey residents, a discount of 50% with free P&P is available on SelectaDNA Home Kits. Just visit www.selectadna.co.uk and use the discount code ‘DNASURREY50’ to order a kit for just £29.75. How should we care for our countryside? Residents can help shape plans for Surrey County Council’s (SCC) countryside sites for the next 25 years. The plans will form a strategy which will outline how the council will care for the countryside and protect it for future generations. The strategy is being developed with Surrey Wildlife Trust which manages the sites; and runs alongside a programme to make the countryside self-funding, so improvements can continue to be made without reliance on SCC funding. Residents can share their views until 3 December 2018 by visiting the SCC website, or by calling 03456 009 009 or texting 07860 053465 for a printed questionnaire. SCC owns or manages 10,000 acres of the county’s countryside which is open for the public to visit. These include Ockham Common in the north of the county, Norbury Park in the south, Chobham Common in the west and Staffhurst Wood in the east. Lots of residents use these sites for recreation, health and wellbeing, but they’re also places where people work and live. Additionally, the sites are beautiful landscapes which provide vital habitats for wildlife. We need to ensure that the balance of this usage is maintained. The strategy is being developed with Surrey Wildlife Trust which manages the sites. It will run alongside a programme to make the countryside self-funding, so improvements can continue to be made without reliance on SCC funding. The views of residents are vital to help shape this strategy, responses will be taken into account and considered by SCC’s cabinet in early 2019. Residents can share their views until 3 December 2018 by visiting the SCC website, or by calling 03456 009 009 or texting 07860 053465 for a printed questionnaire. 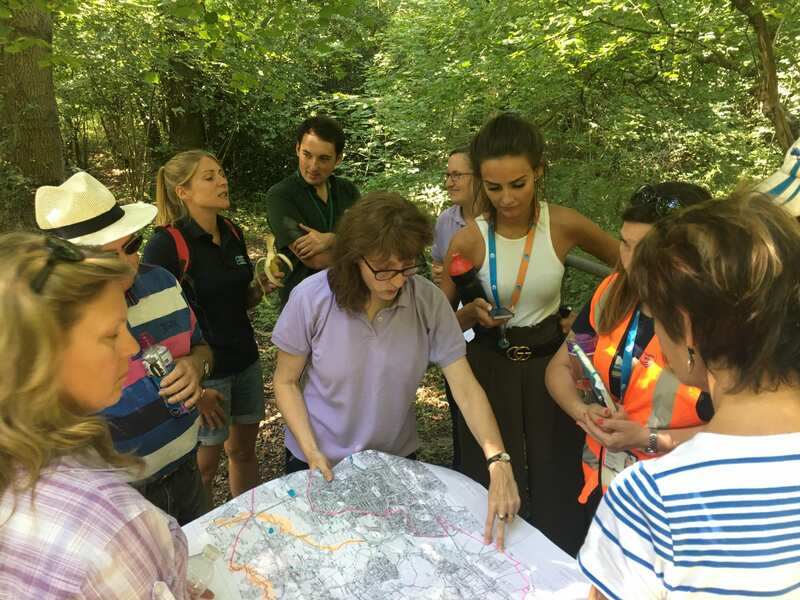 PC Laura Rowley, the Wildlife & Rural Crime Coordinator for Surrey Police talks about rural crime in our county – “Surrey is one of the country’s most beautiful counties; it is in fact the most wooded county in the UK. It is home to a wealth of wildlife and offers us access to some truly wonderful places to explore. However, we face a very real threat from criminal individuals who exploit our communities and damage our rural surroundings. “As Surrey Police’s Wildlife & Rural Crime Co-ordinator, much of my time is spent helping our officers and staff understand what rural crime is. At the moment we have four crime types that we are concentrating on reducing across the county and, by working with our communities, we can tackle these incidents; but what can you do to help? If you own a dog, or walk dogs for a friend or as a business, please ensure you keep them on a lead when near livestock. If you find they become agitated or excitable when near livestock, walk them away and consider an alternative route. If you are a land owner, consider placing clear signs at any entrance points to your land warning dog walkers that there is livestock in the field. This can help prepare a dog walker to take the necessary steps to reduce the risk of an incident. Speak to your local neighbourhood team about our Livestock Worrying signs. If you witness, or are a victim of, livestock worrying, please call the police immediately. If you regularly walk or jog in rural areas, consider looking out for the potential signs of hare coursing, which is a form of poaching. It often happens at dusk or dawn around harvest time (late-Aug/early-Sept) when large tracts of land are crop-less. You may see a group of vehicles parked in a rural area, by a farmland gateway, on a grass verge, track or bridle path. Usually these are estate cars, 4x4s or vans with evidence of carrying dogs. Hare coursers often travel in convoy with minders’ vans front and rear. If you witness hare coursing (or evidence of any other form of poaching), contact the police immediately. Do not approach participants. Green Laning is where owners of off-road vehicles, such as 4x4s or trail bikes, take them to ‘Green Lanes’ (so called due to the dense vegetation and unsurfaced road) for recreational driving. This, in itself, is not illegal, however there are some who are taking their vehicles on land they should not be on, including heritage sites or SSSI (Sites of Special Scientific Interest). This can cause permanent damage to the land and its wildlife. Many of our rural community own valuable plant machinery, such as tractors, land rovers or quad bikes. These are often targeted by thieves and, if stolen, can have a devastating effect on the owner’s livelihood. It is vital that theft of plant machinery is reported as soon as possible, but there also are some actions you can do too, to help protect your machinery. Install CCTV, regularly check it is not obstructed and put up camera warning signs. Mark your machinery; consider etching, stamping or forensic fluid. Ensure all machinery is stored in a secure, locked building. “The impact of these crimes can be considerable to our rural communities and it is very important that we ensure we help our residents prevent such crimes from happening. How do you report rural crime? “Surrey is blessed with a very active, highly integrated rural network. From dog walkers to landowners, farmers to horse breeders. We value each and every one of our county’s communities and want to ensure we work closely with them to ensure we have the most accurate picture possible of any criminal activity happening in your area. 1) Call 101 to report crime, or dial 999 in an emergency or if a crime is in progress. “You are our eyes and ears and we want to continue to build strong relationships with our rural communities, and as such InTheKnow is an excellent platform for us to communicate with you. The more of rural Surrey we have on InTheKnow, the broader our reach is and the better our impact will be on preventing crime and protecting our residents. If you know someone who would benefit from receiving updates around rural crime, please do forward this message onto them or direct them to https://www.InTheKnow.community, where they can sign up. Working together with Surrey’s rural communities. SURREY COUNTY COUNCIL PROPOSE TO MAKE the above mentioned Temporary Order under Section 14(1) of the Road Traffic Regulation Act 1984, the effect of which will be to temporarily prohibit vehicles from entering or proceeding in that length of Salt Box Road (C14) Guildford as extends from its junction with the circulatory carriageway comprised in the roundabout situated at its junction with A320 Woking Road to its junction with the circulatory carriageway comprised in the roundabout situated at its junction with A322 Worplesdon Road. Vehicular traffic will be diverted via Worplesdon Road (A320), Dennis’ Roundabout, Middleton Road (A25), Woodbridge Road (A25), Ladymead (A25), Stoke Crossroads and Woking Road (A320) or this route in reverse order. This Order is required to enable Surrey County Council to carry out winter damage repair works and/or major highway maintenance works. These works are anticipated to be carried out between 09.30hrs and 16.30hrs, as soon as possible within the 18 month period of operation of this Order which commences on 23 August 2018. Advanced warning signs will be displayed and the temporary closure will only operate when the relevant traffic signs are displayed. Access to premises within the affected length of road, including access by emergency vehicles to these properties, will be maintained at all times, as will access for pedestrians and cyclists. Any vehicle found to be obstructing the highways during these works will be removed to a suitable location outside the limits of the works after all reasonable methods have been undertaken to identify and contact the vehicle’s owner. 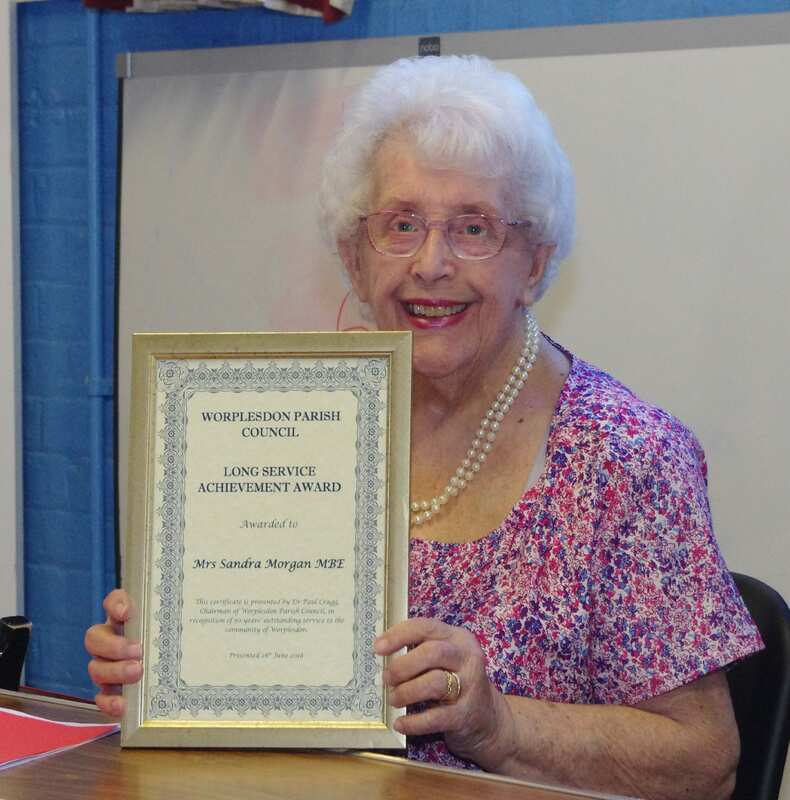 Cllr Sandra Morgan MBE achieved a milestone of 50 years’ service to the community this year. At the June full council meeting Cllr Morgan was presented with a long-service certificate and bouquet of flowers by the Chairman Cllr Paul Cragg. 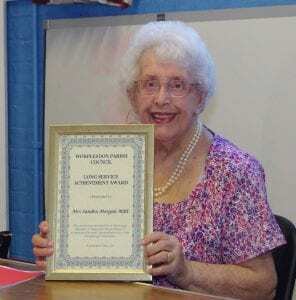 The Parish Council offers its congratulations on this amazing achievement! Some of you passing the Village Hall in Jacobs Well may have noticed that the Scout and Guide HQ has suddenly got a lot busier with Beaver and Cub Scouts. We have managed over the last year to find volunteers to start 2 Beaver scout and 2 Cub scout units, and I am pleased to say that all are happy and numbers are growing, 78 at last count. They are growing so much that we are hoping to start a Scout troop at the end of the year. It will be about 20 years since the Village had a troop if we are successful. We have lots of eager recruits but need some adult volunteers to make it happen. I can imagine you are now thinking, I can’t be a leader, I know nothing about Scouts, I don’t have the time, but Scouts has changed a lot in recent years, the values are still the same but if commitments mean you can’t be there every week, that’s okay, you know nothing about Scouts, there is full training available to suit you. We are aware of the traveller encampment on Wood Street Village Green, and are in the process of doing all we can, as quickly as possible. The travellers who arrived on Saturday 14 July will be served with a notice directing them to leave as soon as possible. We are working with the police who are also aware of the current situation. If the caravans and accompanying vehicles have not left site in accordance with the direction to leave, we will take further action through the legal process. We are monitoring the situation and have provided the occupants with bin bags, and made arrangements to remove any rubbish. If you are reporting anti-social behaviour or criminal activity, please contact Surrey Police on their non-emergency number 101 or 999 in an emergency only. Planning to ensure the potential development at Blackwell Farm doesn’t have a detrimental impact on our existing communities. 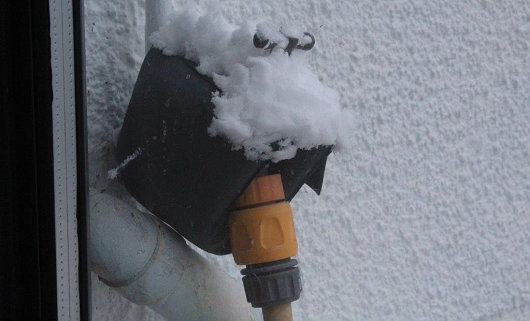 Water pipes can freeze if they are not properly insulated and can then burst as the thaw comes. Should you find you have no water, first check the South East Water website In Your Area map at inyourarea.digdat.co.uk/southeastwater to see if there is a problem on the supply network. If no incident is showing, check with your neighbours to see if they have water. If they do, you should check for frozen pipes and take action to prevent a burst, which can cause damage. Slowly thaw the pipes by wrapping them in warm materials like towels starting at the end nearest to the tap. You could ask your neighbour for some warm water to soak the towels in to speed up the process. If you and your neighbours do not have water and no incident is showing on the South East Water website, call 0333 000 0002 to report the problem. For details on how to wrap up homes for winter go to: southeastwater.co.uk/wrap-up-for-winter. Land to the north of Keens Lane in Worplesdon has been identified in Guildford Borough Council’s Submission Local Plan to deliver 150 new properties and a 60+ bed specialist (dementia) care home. The developers, Ashill are holding a drop in session to meet their team and see the plans on 23rd February 2018, between 4 – 8 pm at Worplesdon Memorial Hall, Perry Hill, Worplesdon, GU3 3RF. In light of these proposals Worplesdon Parish Council commissioned an Independent Traffic Report, which was carried out by specialist Traffic Consultants – RGP – You can view the report by clicking here.